When you try to set up your mic through ease of access or Speech recognition from Windows 10 control panel, suddenly, it shows Wizard could not start microphone in Windows 10 with a description that reads “Make sure your audio hardware is working properly and check your audio configuration in the Audio Devices and Sound Themes control panel”. The issue can sometimes happen after a major Windows 10 update where there is a high chance that the drivers of hardware in your computer got messed up by the update or new features that were introduced cause a conflict between these devices. 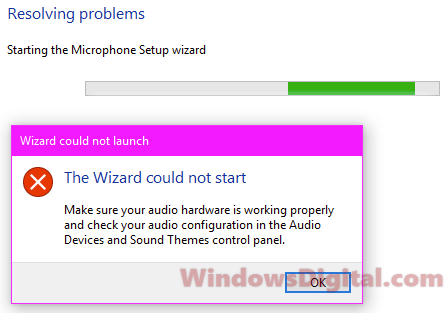 I’ve listed several solutions below, including the one that fixed mine, to help you troubleshoot your microphone problem, particularly the Wizard could not start microphone in Windows 10 error. In most cases when this error shows up, it’s because the Microphone was disabled in the Windows 10 privacy settings. Here’s how to check if you’ve the setting enabled. In Windows 10, press Win+i key to open Settings app. Select Privacy. From the left pane, select Microphone. On the right pane under Allow apps to access your Microphone, make sure it’s toggled On and set to be enabled. Retry the speech set up again and see if the wizard could not start microphone Windows 10 error would still appear. When there is a new Windows update, devices such as microphone could become incompatible with the latest update and, thus, need a driver update. If you know how to search for or where to download the microphone’s driver, download and install it and see if it fixes the problem. 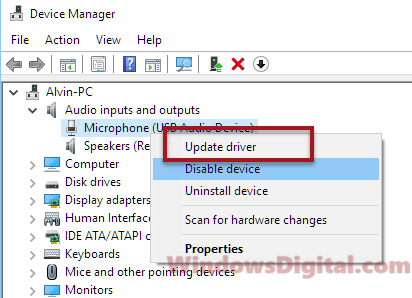 If you don’t know if your microphone’s driver is updated or even working, try to uninstall it and run Windows Update again to let Windows install the latest driver for you. Here’s how to do it. Go to start menu / Windows Search. In Device Manager, expand Audio inputs and outputs. Right-click your microphone. We’ll try letting it to update the driver first. Click on update driver. If there is an update installed, try setting up your microphone again and see if it works. If no update was installed, right-click it again and select uninstall device. Restart your PC. Windows should automatically find the best driver from Microsoft’s drivers repository and install it for your microphone. This is the workaround that actually solved my issue with The Wizard could not start microphone Windows 10 problem. Whether you are using a specific sound card or the built-in sound controllers on your motherboard, you will need to make sure they are updated and working as intended. A sound card is a device that allows communication between your microphone and your computer. If it stops working, neither your speaker or your microphone would work. To update the sound driver, go to Device Manager as shown in the steps above. Expand Sound, video and game controllers. Right-click the sound driver you are currently using, then select Update driver. Then select Search automatically for updated driver software. Windows will then automatically search for and download the latest compatible sound driver that best matches your device for your PC. In most cases, we use Realtek High Definition Audio. For some people who use specific sound cards, it will be otherwise such as Nvidia High Definition Audio or USB Audio Device. If you are not sure which driver you are using, just right-click each one of them and update all of them. If updating or reinstalling the driver doesn’t work, or if you don’t see your microphone or your sound card driver from the list in device manager, try the next solution. Try to reinsert the microphone jack first to make sure it’s not because of a loose connection of the jack. If it doesn’t work, try to move the microphone plug from front to rear jack, or vice versa if your microphone was using rear jack. Then, try to set up the microphone again. Windows update will sometimes cause conflicts between hardware, especially when you have multiple devices of the same type. For example, if you have more than 1 microphone (often happen in laptop since most of them have a built-in microphone), Windows will sometimes be unable to identify which one to use. 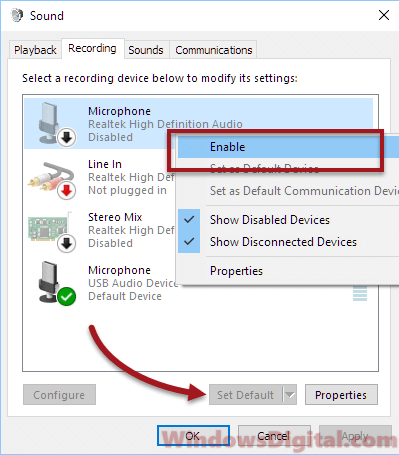 To check if your microphone is selected, enabled and set as default, go to start menu. Search for Sound. Go to Recording tab. Right-click on your preferred microphone and select Enabled. While it’s selected, at the bottom, click Set as default. Then, go ahead to set up your microphone again. Description for sharing: When you set up your microphone, it shows Wizard could not start microphone in Windows 10 with a description that reads "make sure your audio hardware is working properly and check your audio configuration in the Audio Devices and Sound Themes control panel". Thank you, your page helped me get the issue with my microphone fixed, in a matter of seconds. It was the privacy settings.